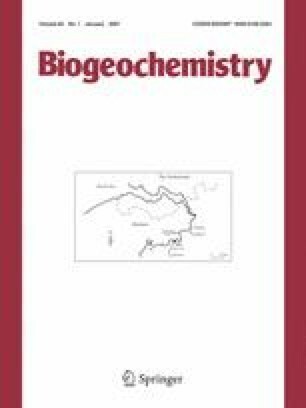 The sequestration and recycling of biogenic silica (BSi) in freshwater tidal marshes was modelled through the combination of short-term year round sediment trap data with a long-term sedimentation model, MARSED. The modelling was implemented through the complete evolution from a young rapidly rising marsh to a marsh with an elevation close to mean high water. BSi in imported suspended matter was higher in summer (10.9 mg BSi g−1 sediment) than winter (7.6 mg BSi g−1 sediment). However, the deposition of BSi on the marsh surface was higher in winter compared to summer, due to the higher sedimentation rates. Deposition of BSi was correlated to the suspended matter deposition. In the old marsh, yearly about 40 g BSi m−2 was deposited, while in the young marsh deposition could rise up to 300 g m−2. Young marshes retained up to 85% of the imported biogenic silica. Recycling efficiency (60%) increased drastically for older marshes. The study shows that marshes act as important sinks for BSi along estuaries. The recycling of the imported BSi to DSi in summer and spring is most likely an essential factor in the buffering role of tidal marshes for estuarine DSi concentrations. L. Clement and E. De Bruyn analysed samples in the “UA, University of Antwerp, Department of Biology, Testing Laboratory for Chemical Water Quality”. We would like to thank them for their continuous dedication. Special thanks to IWT (Institute for Promotion of Innovation through Science and Technology, Flanders) for scientific project funding (project number 13263 “The role of freshwater marshes in the estuarine silica cycle”) and to FWO-NWO (Fund for Scientific research, Flanders, The Netherlands) for funding project n° 832.11.004 (“The role of freshwater marshes in the retention and transformation of nitrogen in estuaries, a whole ecosystem labeling study”). We would further like to thank FWO for funding the Scientific Community ‘Ecological characterization of European estuaries, with emphasis on the Schelde estuary’ (project nr. W 10/5-CVW.D 13.816). Thanks to Jack Middelburg, Hans Backx, Tom Maris and Kris Bal for their constructive reviews. NIOO-KNAW publication number 3900.